It might seem quite strange to think that the Domain Name System, actually plays a role in filtering and region locking however it is actually true. In fact DNS has been used extensively on both sides of the battle both for blocking access and bypassing content filtering. It’s most extensive use is historically as a very blunt weapon to block access to websites. Many countries still use DNS poisoning/spoofing in order to block access temporarily to specific sites. Turkey for example still periodically uses DNS to stop people accessing social media sites, supposedly in the ‘national interest’. It’s quite simple to do, you just modify the DNS records of the sites at the major ISPs in the country. So instead of Facebook resolving to the true IP address it is routed through to a government server instead. It’s a simple method and fairly effective although easily bypassed by using a trusted DNS server instead of the modified ones. However on the other side of the coin, perhaps more surprisingly you’ll find DNS used to bypass region blocks. What happens is that you use ‘Smart DNS’ servers to effectively make decisions to route traffic. 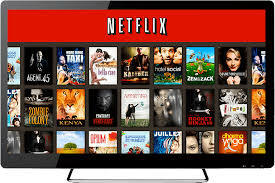 For example many people use a Smart DNS Netflix system to enable access to different regions of the Netflix media sites. All the server does is route the connection through the appropriate country before accessing the Netflix website. SO if you want to use American Netflix you’ll be routed through a US based server – through a British one for BBC DNS and so on. The advantages of using DNS in this situation is that you only route when absolutely necessary unlike a VPN. The other significant bonus is that it’s simple to modify DNS settings on any device, without the requirement of installing software on the client. 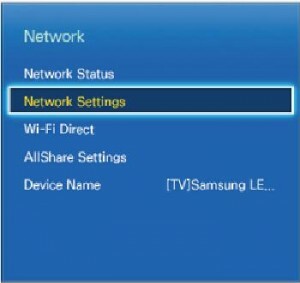 This means you can use Smart DNS on TVs, Tablets, games consoles and media streamers simply by accessing the network settings and specifying the modified DNS servers. There are literally millions of people who use Netflix through a VPN service, yet over the last few weeks they’ve had real problems. Although these people obviously have to subscribe to Netflix, they use VPNs to hide their location and gain access to different version of the Netflix library. The reason is simple, although the subscription cost is similar wherever you are, the US version of Netflix has much more content that the other locales – if you use a US based IP address then you’ll be able to access that version irrespective of your actual location. So basically people are able to access Netflix America in UK and all the extra movies that entails. Unfortunately not any more, recently Netflix block VPN services across the board using a new technique not used previously. Many of the online media giants try and block people using VPN and proxy services to access their content, with mostly mixed results. This is because it’s virtually impossible to completely detect the presence of a VPN, so the usual tactics involving manually locating these services and their addresses, or monitoring for multiple connections on single addresses – then adding them to a block list. It’s very time consuming and resource intensive, also it’s easily countered by simply rotating the addresses used on the servers. So How do Netflix Block VPN Services Now? It’s pretty sneaky but devastatingly effective as people have found out. It’s all to do with the classification of IP addresses and being able to detect them automatically. As well as being classified by location IP addresses are also tagged with another label – residential or commercial. This is an important piece of information that Netflix have used, instead of trying to identifying individual connections, they have merely blocked any commercial IP address from connecting. Virtually every VPN server resides in a data center somewhere and hence will be tagged as a commercial IP address. The residential addresses are mostly assigned by ISPs directly to individual users and are allowed to connect without restriction. 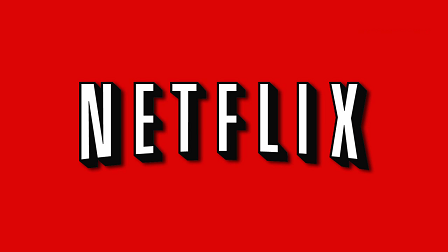 The resultant effect – Netflix block VPN services virtually across the board and lots of very unhappy subscribers. Now you have been able to buy residential proxies for some time, many internet businesses use them to place multiple adverts and for Facebook promotion techniques. However they are very expensive and if you want to buy private residential proxies then they will cost you hundreds of dollars a month. Which are still Working – Residential VPN Services? There are a couple of services still working but not many, there are not many residential VPN services currently but that may change as the service providers change. The solution is to ensure that any connection used to stream content from Netflix comes from a residential IP address and not a commercial one. The problem though is that these IP addresses are much harder to come by than the commercial ones, they also cost significantly more to run servers on due to the bandwidth requirements – at time of writing there is for instance only one US DNS Netflix solution which is working. One provider that has instigated a novel solution is Identity Cloaker who have designed a system where only traffic routed for the Netflix servers is rerouted through a bank of residential IP addresses. This means that they can ensure that you are only routed through a residential IP proxy when necessary therefore minimizing the cost and bandwidth on these servers. They already have a very low key approach to accessing media sites, they never advertise the functionality, currently it’s one of the very few VPN services still working with Netflix. Your IP address can seem to be located in any country you like if you have the resources to change it. For example to access many sites based in France you must have a French network address or you’ll simply be blocked or filtered. It follows that anyone might easily acquire a French IP address by using a VPN to hide your location. The simplest solution to access French resources is to receive a VPN that supplies a French IP Address. All that really needs to be done in order to bypass the region locking during registration or access is always to utilize a web proxy or VPN from France. Another of the fastest methods to hide your IP address is with a proxy site. You’ll get significant browsing speeds along with a high degree of anonymity. It is probably the top choice in regards to hide your real IP address, but they’re not free. The actual fact is the fact that if a site is absolutely intent on blocking all and every non-local visitor, they will be able to do this. However an increasing problem is that proxies now can be detected relatively easily and can be blocked automatically. You’re learning English and urge to surf the Internet as though you are located in the uk. You’re learning French and urge to surf the Internet as though you are located in France. Very wide selection of entrepreneurial and company uses. Therefore, if somebody would be to access any neighborhood French chat program from outside of France he will need to obtain a French IP address as a way to achieve that. The important dilemma of web proxies may be the speed that is considerably low. However it is an excellent site and has every one of the top US and European shows in addition to some French stuff. If you’re searching for a comparison of VPN providers within the French language, you are going to find Meilleur VPN an outstanding website. 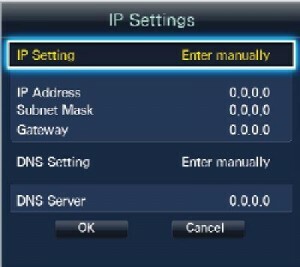 VPN will usually provide you with a lot of choices to choose IP from. The main aspect is to pick out a provider who offers a huge variety of available servers. There are plenty of VPN providers all over the world. It is a hassle to get legitimate services and take lots of effort on your own part. In my experience Identity Cloaker is the first out of many VPN providers available on the market, for a good service and the top value for the money. There are a couple of simple and simple steps which you want to follow as a way to receive a French IP address. You need to select the server that is nearest to you. If you’re located somewhere outside France and you’re in need of the French IP address it can readily be arranged. The further away you’re from the remotely located server the increased impact to performance you’ll start to see. 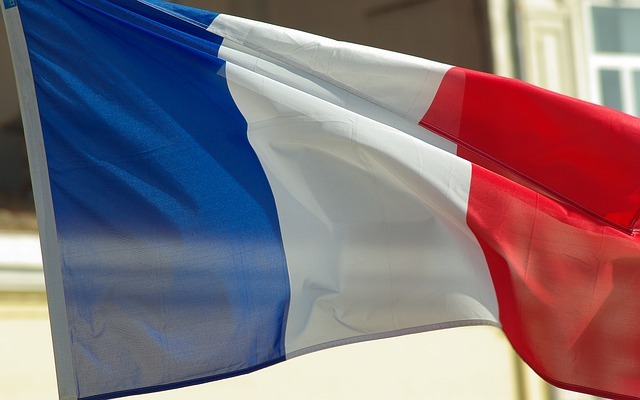 To be able to possess the French IP a massive part of this may be unavoidable. Ultimately, complete bibliographic info, for example, size of the electronic file in addition to a neighborhood call number is contained within the header of the electronic text. Agreeing with the research, young individuals are leading the way in regards to VPN usage, with almost 1 third of individuals between 16-34 having used a VPN. The list might be filtered by a lot of attributes which include the port number of the proxy, country of origin of the proxy, and the degree of anonymity of the proxy. It turned out, however, the option wasn’t visible enough for users. Although I’ve worked in IT for many years, for much of that time managing IP addresses wasn’t really that much more than an admin task to be completed. In my earlier career many corporate network administrators didn’t really trust or use DHCP and assigning IP addresses individually was typically very common. This led to a huge lead in time for assigning anything new on the network, you couldn’t just plug a PC onto the network and it would work – no forms needed to be filled in and requests for IP allocation had to take place, often from a huge IP address spreadsheet. Nowadays this wouldn’t really work, there are so many devices on most networks that managing the addresses manually would take forever. When the internet arrived in the early 90s of course, IP addresses became much more important – simply because each and every device needs a unique address to communicate. Suddenly the IP address took on a whole new significance, it was now your unique identifier and it could be used to monitor how long you spent online, what you downloaded and web sites you visited. Not only that but your address is recorded in all sorts of places and people to customise, monitor and effectively control your online activities. Take for example something as simple as visiting Google and searching for something – have you ever noticed how your web results display local results? This is because Google is recording your location and using that information to tailor your search results. Of course this is useful but your address will also be used to block access or filter content too. Of course using a system like this whilst stopping your address being logged will also have other effects. For example if you’re hiding behind a US IP address and are based in France you’ll get redirected on that basis. It can be a pain being directed to US sites by default, when you really want the French version. 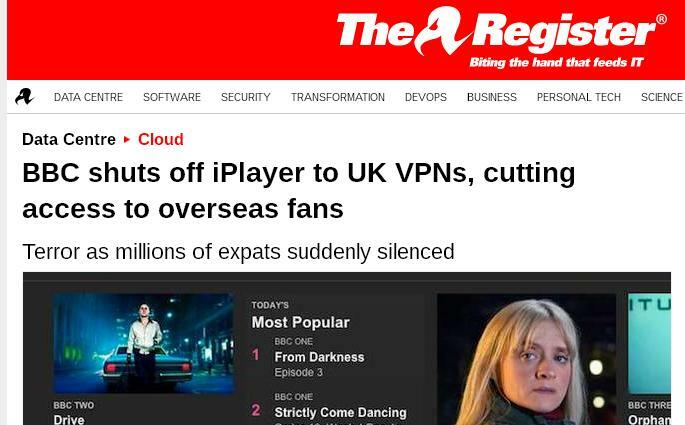 So it’s best to try and use a VPN server in the same country unless you want it to bypass geoblocked sites like BBC and Hulu. These are among the many thousands of major media sites which will block access based on your location. However switching countries can in this circumstance work to your advantage, use a UK one to watch the BBC online, a US one to access Hulu and etc. Smart TVs are getting smarter, that’s for certain, the days when your TV would simply display a few channels received from a television aerial are long gone. Today’s Smart TV are multimedia powerhouses which can access and display all sorts of content from a variety of different sources. For example a standard Smart TV will be able to use applications to access internet based sites like Hulu, BBC iPlayer, ITV player, Netflix, Youtube and a host of others. Just plug your TV into your network and you can access all sorts of resources that previously were only accessible from your home computers. However with this new power comes the annoying restrictions too, geo-locking technology that blocks access to different sites on computers has the same effect on our TV sets too. Our Netflix is locked to the crappy version we normally get and millions won’t be able to access things like BBC iPlayer or HBO online unless we start shipping or TV with us internationally. The blocks work in the same way as they do on computers, your IP address is checked and location noted then you’re allowed access or blocked depending on where you are. BUT WAIT – IP Address on my TV, it’s not a computer? Well a Smart TV is pretty much the same as a computer at least if it wants to access the internet, any network enabled device needs an IP address to function online. Which also means it needs a host of network settings to allow it to talk to your router or access point and ultimately use internet based resources. So does that mean you can also use USA proxies and VPNs (see here) to bypass these blocks like millions already use on their computers? Well it’s possible but usually a little tricky simply because you’ll only have access to basic functionality on a Smart TV – it’s much easier to use a system called Smart DNS. Here’s the one I use, after testing about 10 of them earlier last year. They are called Overplay and to use on your Smart TV is actually quite simple, all you need is the cheapest service – Smart DNS. 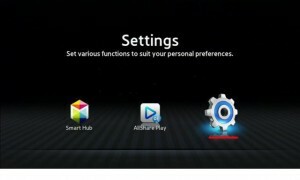 Once you’ve enabled your account, by visiting their registration page from any computer, phone or tablet on your network then you just need to enable it on your Smart TV. This process will vary depending on your TV but you’re basically looking for the Network Settings page. Which is where, all you need to do is to input your new Smart DNS server in the DNS server settings. This turns your Smart TV into an international traveller able to adopt a disguise whenever needed. When you click through to the Netflix Application you’ll be able to access the US version, play BBC iPlayer from anywhere in the world or in fact any UK Television stations. The Smart DNS server will apply a little disguise to your connection wherever you need it to. No software, no VPN, the SMart DNS server will do it all for you without rerouting your connection. Is Speed Important for a VPN Service? Years ago, I had a very exciting job installing a VPN client from IBM on thousands of laptops in a Pharmaceutical company. They took security very seriously, the stakes are high with regards drug and research – many of these laptops had direct access to all sorts of confidential data. All the laptops were secure, all had full disk encryption multiple authentication requirements and if they were lost they could be remotely locked too. For many years, the company refused to allow access to the internet using company laptops citing the security issues. However over the years the pressure became greater, people got fed up of carting two laptops every where and the tablet wasn’t quite as ubiquitous as they are now. Eventually they gave in and allowed people to use both the internet for personal reasons, but also remote access into the corporate network. There was much expense involved and the laptops were about as secure as they could possibly be in those circumstances using the technology available. One important concepts was the VPN, first it allowed access to the corporate network and secondly it allowed another level of protection for communication online. The IBM client software I installed would look for the nearest company VPN server and connect through to that, all the individuals were supposed to use this method every time they went online. It all looked great in theory although many in security still maintained there ‘no net is safer’ stance. The problem was, the super secure VPN service was very slow, despite supposedly trying to connect to the nearest VPN server – sometimes this didn’t work very well and the client software would pick some remote server on the other side of the world. Also some of the servers just ran very slowly across certain connections, in many cases this was due to routing and hardware issues not related to the servers themselves. For the people who used these laptops, the decision was quite simple – fire up the VPN and suffer tedious waits, buffering and delays or forget to start the VPN and surf normally at super fast speeds that are often available in hotels and remote locations. The reality was very few people ended up using this expensive, global network of VPN servers unless they really had to. A VPN server will always have some impact on speed simply because it’s adding an extra hop on any route. However a fast, well configured VPN service can minimize this extra lag – in fact there are compression technologies that can severely reduce the effect and sometimes they can even speed up a connection slightly. When you are looking at choosing a VPN service make sure that you test relative speed carefully especially before taking up a long subscription. There are a variety of speed tests sites available online and what you should do is baseline your connection without the VPN enabled and then check the impact of using the tunnel. Make sure you check the specific countries you need, for example if you use a VPN to access UK TV sites and media – then ensure that you test the UK servers. Often popular countries are overloaded with requests whilst other servers may run much more quickly because they’re underutilized. You’ll get some very different answers depending on where you ask this question. If you happen to frequent security, technology or hacking groups or forums then there’s little point asking the question, the answer will be a resounding yes. On the hacking forums, there will be much ridicule too for even asking whether you need a VPN in the first place. The general opinion of the technically savvy would be firmly in the ‘yes’ camp. Other’s are likely to see less of a need, many still believing the mantra – ‘I have nothing to hide’ so what’s the point. The problem is that anyone who uses the internet for any purpose almost certainly has something to hide – anything from their credits card numbers to a personal email address (which gives access to lots of other services). This of course, refers to the many internet baddies who are utilising the web to build huge criminal enterprises with all the cash of traditional activities but without the inherent risks. The other aspect of the question is ‘who’ you’re thinking to be safe from. Almost all of us want to keep our details safe from the cyber crooks, but how many of us care that the authorities can see what we do online? Many people feel that the police and investigation services need access to our email and web histories in order to catch terrorists and criminals. Other’s think that it’s unacceptable to spy on an entire population in order to catch a few baddies. First a video which reference the subject – Is VPN Safe? Of course, it’s up to the individual to decide on the whether they do need to use a VPN. What is worth considering though is the plain facts of what happens when you use the internet without one. The vast majority of your web activity happens in clear text (SSL excepted). ISP Logs contain every web site we visit, everything we download and message we send. Every web site you visit can record your identity. When using an untrusted network anyone can steal any of your details used when online. For me ultimately, it’s the ease in which it’s possible to steal online without using some sort of encryption method. The fact that it’s relatively simple to steal credentials that give access to email, online banking and paypal accounts and steal thousands makes me incredibly wary. I suspect if many knew that this was technically possible they would also be equally as paranoid as the guys in the hacking groups. One things for sure, there’s lots of free stuff on the internet if you’re struggling for cash. If you have the time and inclination you probably don’t have to ever miss another blockbuster ever again without spending a penny on DVDs or cinema tickets. That’s not going to change in the near future unless the industry severely changes it’s business models. Of course, it can be incredibly time consuming and frustrating experience trying to download a film as more often you end up with a version filmed from the back of a cinema, muffled sound, dark images or my personal favorite where the last ten minutes seems to have disappeared. There are dangers as well as frustrations too, over the years there have been more and more cases of people being heavily fined for downloading and watching copyrighted films. These are ordinary people who just download the odd movie, yet fail to realise that their identity is easily obtainable from their ISP. However when you are assessing what free’ things are worth the risk on the internet -then beware something like a US or British proxies are most definitely not one of them. People insist on using these free proxies as opposed to buying an IP address, that are posted and harvested on the internet but it’s incredibly risky. For a start most of these servers are simply misconfigured, so technically using them without the owners permission constitutes a criminal act in many countries. However another large proportion are there simply to steal people’s personal information, hackers log and eavesdrop your internet connection looking for usernames and passwords. This is an example of a paid UK proxy service which of course has the disadvantage of costing money. However in reality that’s unlikely to be the case, as it works well, is fast and can stream video with ease and it won’t put your personal details at risk. Of course, whatever people say – many are hard coded into the ‘free’ search. However it’s worth stepping back and thinking sometimes about free proxies and VPNs. Even those that look legitimate like the browser add on Hola have to extract something from you in order to at least cover the costs. We all thought that Hola merely riddled your computer with adware and affiliate links but turns out it actually steals your bandwidth too by using your computer in a commercial botnet (it’s true check that link or Google). The reality is that providing a proxy service costs a lot of money, the bandwidth costs, the support team have to be paid so why would anyone provide that for free? The answer is that they don’t, there is always a cost.